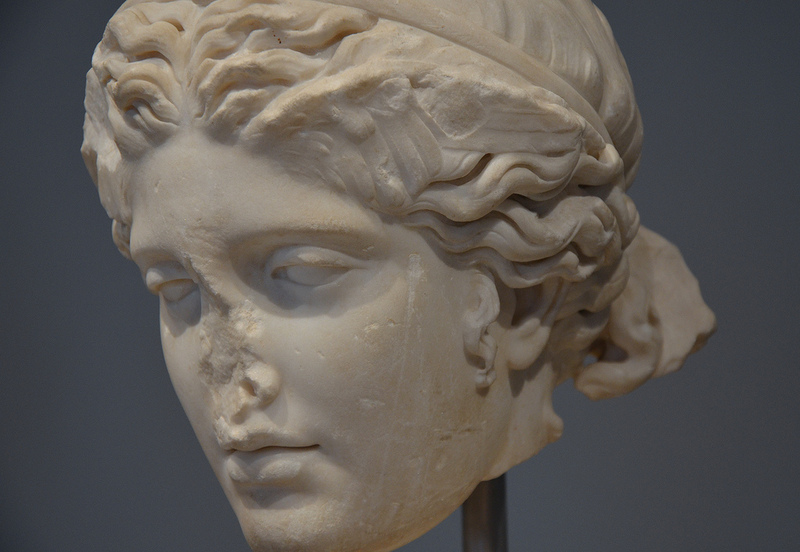 This month’s sculpture from Hadrian’s Villa is a marble head of Hypnos, the Greek god of Sleep. Hypnos is represented as a young man with wings attached to his temples (now lost). The head must have been part of a full length statue showing Hypnos running forwards, holding in his hands poppies and a vessel from which he presumably poured a sleeping potion. One of the most complete representations of Hypnos is a bronze statuette from the collection of the National Archaeological Museum of Florence (see an image here). 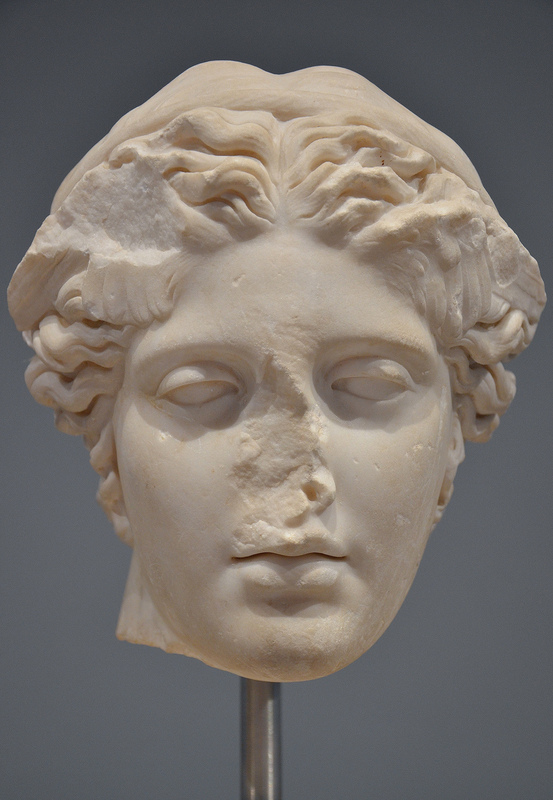 This marble head of Hypnos was found inside the cryptoporticus of the Piazza d’Oro (Golden Court), one of the most luxurious complexes at the villa. It was a vast building complex with a great rectangular garden embellished with flower-beds. A canal was running down the main axis and was surrounded on all sides by a portico. On its eastern side was a series of rooms including a triclinium, while on its southern side, opposite the entrance, was a monumental exedra with a nymphaeum and perhaps also a library. 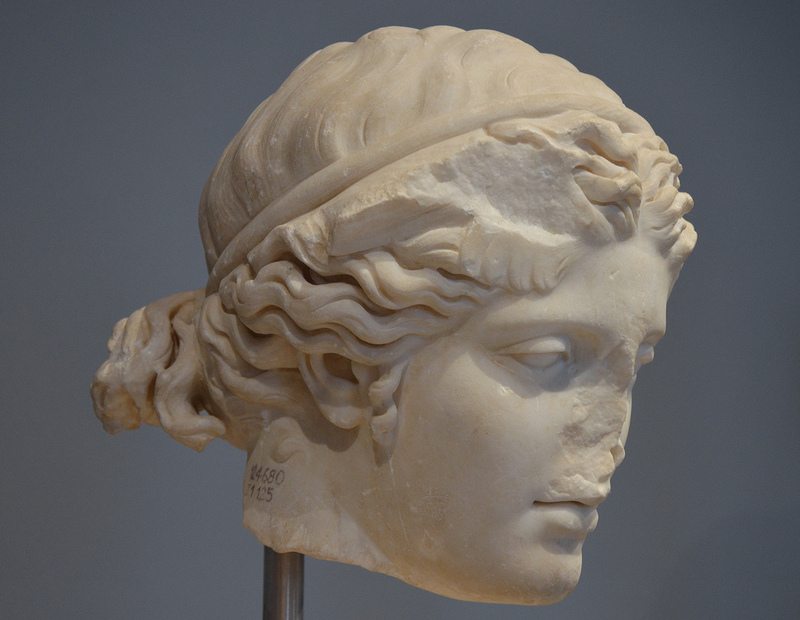 This head of Hypnos is on display at the National Roman Museum – Palazzo Massimo alle Terme, Rome. Beautiful Photo’s Carole. I love these sculptures. I cannot tell you how much I love your blog. You know so much about Tivoli and the sculptures. Can you tell us what happened to Tivoli and the villa in Late Antique times. Do we know when it was abandoned? Was it well maintained in the early 5th century? Are there any records?